Matthew and Daniel Hansen are the grand-prize winners of the Crown Royal “Your Name Here” contest. 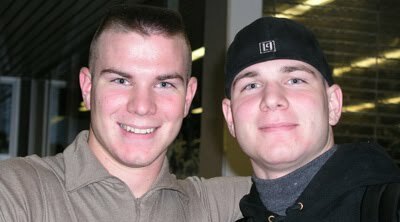 Matthew and Daniel joined the U.S. Marine Corps (USMC) in 2002. 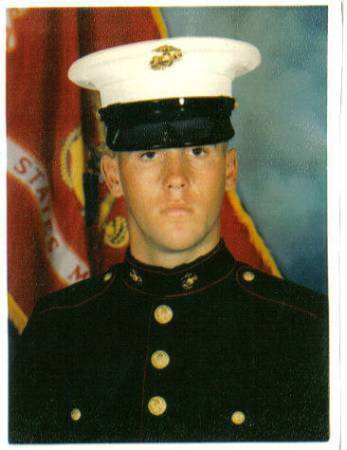 Due to injury, Matthew who served in Operation Iraqi Freedom, now works at a military base in San Marcos, near to my hometown. He hopes to return overseas again on duty. Daniel was selected to protect President George W. Bush at Camp David in 2004 and later Lieutenant General Richard C. Zilmer, USMC while in Iraq, before falling victim to a roadside bomb supporting combat operations in the Farah province of Afghanistan on February 14, 2009. As I ready myself for my adventure to Richmond for that special Sprint Cup Race, the story of twin brothers Matthew and Daniel Hansen brings to mind three other young men from San Diego’s North County. Therefore, as I fly to Richmond, this April 29th to honor Matthew and Daniel Hansen for their service and sacrifice, I have mixed emotions. I am excited to be attending the Sprint Cup race at the Richmond International Raceway. I am also pensive as I commemorate the seventh anniversary of our hometown hero’s death. Most of all, however, NASCAR Race Mom is extremely grateful to both Crown Royal and NASCAR for giving America this opportunity to remember and honor the expense our military families pay to protect our rights and freedoms. ‘Capture the Crown’ is a two-day-event to be held at the Richmond International Raceway during the Crown Royal “Your Name Here” 400. The program will features nine online ‘influencers’ competing in team play in a Scavenger Hunt to accomplish tasks for points. The team with the highest number of points at the end of the race will be named the winner. The winning team will be invited to travel to Las Vegas, Nevada from November 28-30, 2011 for the “Crown Royal Race Matt” program. They will also receive a charity donation made in their name to a charity of their choice! The Scavenger Hunt will require me to speak with and photograph, contest winner, Matthew Hansen; Sprint Cup Driver, Matt Kenseth; Country Western Star, Rodney Atkins; The Crown Royal Master of Whiskey and Lieutenant General Richard C. Zilmer, of the U.S. Marine Corps. ‘Capture the Crown’ activities will include a Rodney Atkin's concert, pace car rides and whisky tasting. Having watched my son Moses race in the NASCAR K&N Pro Series West circuit for the last five years, NASCAR Race Mom has come to appreciate the fast paced action of short track racing. 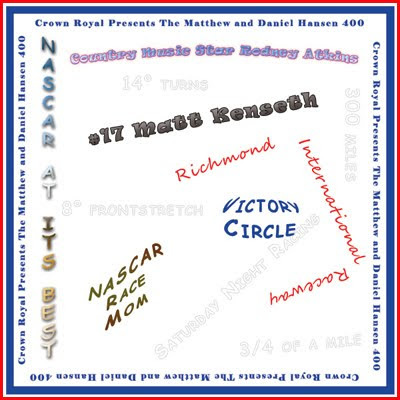 The opportunity to attend the “Crown Royal Presents The Matthew and Daniel Hansen 400” is like a dream come true. I have heard that RIR is the ideal blend of short track and intermediate speedway due to its high-speed corners and banked front-stretch. NASCAR Race Mom will be blogging, facebooking, and tweeting as much as possible during the ‘Capture the Crown’ weekend. Please root for my team as we hunt for enough points to win the competition and win a trip to the November 28-30, 2011 for the “Crown Royal Race Matt” program. 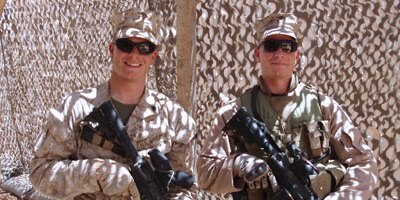 Traditionally, the race has donned only the name of the contest winner, but this year’s race will recognize Matthew, as well as his identical twin brother and fellow Marine, Daniel, who was killed in action on Feb. 14, 2009. Matthew Hansen was unveiled as the grand-prize winner earlier this year during a ceremony led by country music star Rodney Atkins at Daytona International Speedway. Atkins performed his hit song “These are My People” during an acoustic set and added the Hansen brothers’ names to the lyrics signifying their selection as winners. Matthew Hansen lives in San Marcos, Calif., and was chosen from a group of five military finalists who were all nominated by their friends and family for their ability to demonstrate the core values of the military in performing a selfless act that made them a hero. Matthew’s godmother nominated him for amazing service during three deployments to Iraq and for continuing to serve with amazing courage and faith after losing his twin brother and best friend. Thanks to a generous invitation from Crown Royal, I am eagerly looking forward to attending the “Crown Royal Presents The Matthew and Daniel Hansen 400” and the opportunity to meet the 2011 Grand Prize Winner. It will be my honor to shake Matthew’s hand and thank him for his and his families’ sacrifices for our freedoms. We are so grateful for the dedication and courage displayed all our military families. My plan is to share my adventure through photographs, blog posts; and via facebook and twitter. Please feel free to send me a facebook request by clicking here and/or following me on twitter by clicking here. Stay tuned - I will be sharing my itinerary soon. NASCAR K&N Pro Series West director Joey Mancari discusses his responsibilities and shares behind the scenes insight. NASCAR officials Butch Schaefer and Bob Jacobs offer a closer look at technical requirements race teams must adhere to in order to race in the NASCAR K&N Pro Series. Pro Series driver Jonathon Gomez tells us a little about himself and the Heritage Motorsports racing team. Season Opener is on the Speed Channel today. Moses Smith came to Roseville’s All American Speedway hoping to keep his streak alive. He was the only driver to finish in the top 10 in all six series visits to the track since 2008. Last night’s efforts not only extended that streak; it also added him to the list of three other drivers who are tied for the most top-five finishes, with four each. There were 28 entries for the Toyota/ NAPA Auto Care 150, which was the second of fourteen races on the 2011 schedule. The #16 Hasa Pool Products/NAPA Filter Toyota qualified fourth. The racing was tight and unpredictable from the drop of the green flag. Moses managed to move up into third early in the race. He dropped back to fifth for a few laps; however for the majority of the race he battled to stay in-between third and fourth. The side by side encounters keep the crowd on the edge of their seats. The roar of over nine hundred Hasa Pool Products racing fans acknowledge Moses’ move into the lead on lap 137 of the 150 lapper. Moses led for eight laps. However, on the last restart, Moses was fighting to maintain the lead when slight contact with another competitor allowed the eventual race winner to pass underneath him. The second place finish, his career best, seated Moses second in the championship point standings. The race will be televised on SPEED Channel on Thursday, May 5. The NASCAR K&N Pro Series West is back in action next on April 30 for its first road-course event of the year, the Larry H. Miller Dealerships Utah Grand Prix at Miller Motorsports Park in Tooele, Utah. 12:30 to 1:15 p.m. Practice. 3:30 p.m. Qualifying Inspection begins. (Fastest 20 cars earn starting positions 1st thru 20th.) "Impound"
6:15 p.m. Mandatory Driver Autograph session. Three-time NASCAR K&N Pro Series West Most Popular Driver, Moses Smith, will pilot the No. 16 Hasa Pool Products/White Flyer Toyota Camry for Bill McAnally Racing at All American Speedway’s season opener. He will take the green flag on April 16th as the series makes its first of two appearances at the short track located at the Placer County Fairgrounds. The veteran driver has three top-five finishes in six starts at Bill McAnally Racing’s home track. He retains the record for the most top-ten finishes at this .333-mile high banked oval in the heart of Northern California. Currently ninth in the chase for the series championship, Smith and the Hasa Toyota team look to keep their momentum going toward the top of the points standing. They finished fourth in the series last season. The Hasa Toyota team is coming back stronger than ever to the BMR team’s home track. Led by series champion crew chief Mario Isola, the Hasa team is well prepared. They’re looking forward to getting back to short track racing and a being at a race venue that they get such great support. Having so many Hasa Pool Product customers cheering for them is amazing. Over 500 Hasa Customers were in attendance at last fall’s race and were on their feet as Smith raced door-to-door to bring home another top-ten finish. BMR can’t thank them enough for coming out and being a member of the team. We would like to welcome NAPA Gold Filters as an associate sponsor on the No. 16 Hasa Pool Products Toyota Camry. BMR would like to thank all our fans and race partners for their support. NASCARHomeTracks.com will feature a live internet radio broadcast of the NASCAR K&N Pro Series West race from All American Speedway. Advanced tickets are now on sale. Weekend tickets, single day tickets and VIP ticket packages can be purchased by phone by calling (916) 676-0256 or in person at Bill McAnally Racing, 8636 Antelope North Road, Antelope, CA 95843. Tickets are also available through the Placer County Fair office located at 800 All America City Blvd., Roseville, CA 95678. The event is once again expected to be sold out so don’t miss out. Gates will open at 5 pm on Friday. For more information on Moses Smith, please visit www.mosessmith.com. You can visit our sponsors’ websites at www.hasapool.com, www.whiteflyer.com, www.napafilters.com and www.tcitransportation.com . You can also follow Moses on Twitter and Facebook. The NASCAR K&N Pro Series East and West is the highest level of NASCAR's developmental race series. Many great drivers have entered one of the three national NASCAR series from this level. The K&N Pro Series uses race cars that are similar to those used in the NASCAR Nationwide Series with a focus on keeping the costs to a minimum. Points for driver and owner championships are awarded based on the racers finishing position and number of laps in the lead. With attendance topping 10,000, the Western Pool & Spa Show, held annually in Long Beach, California has become one of the premier pool and spa industry trade shows in the United States. This WPSS educates and trains pool and spa service technicians. It also gives manufacturers and distributors the opportunity to reach this very specific and influential portion of the swimming pool and spa industry. The event, held March 31 through April 2nd, included seminars and exhibits. One of the more popular attractions was Booth #447, the Hasa Racing exhibit. NASCAR K&N Pro Series West driver, Moses Smith, was on hand on the opening day to meet with the fans and sign autographs. “The Annual Western Pool and Spa Show is something that I look forward to each year. Many of my fans are in the pool industry, so it is fun to be able to hang out with them and be able to spend some quality time. Most of the time I see them at the track, and I really only have time for a quick hello, but the pool show is different, a lot less stress…” Moses detailed. Gloria Wilson, Director of Advertising Hasa, Inc. pointed out that the 33rd Annual Western Pool & Spa Show coincided with the Hasa Racing, ‘Go Moses’ contest. 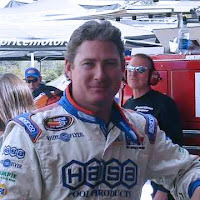 Fans can logon and register at www.hasapool.com to win a trip for four (4) to the 2012 NASCAR Daytona 500 and other weekly prizes. You only have to enter once a week to be eligible for the weekly prizes, but you can enter once per day for the best odds of winning. This exciting opportunity runs from April 1 to December 1, 2011. 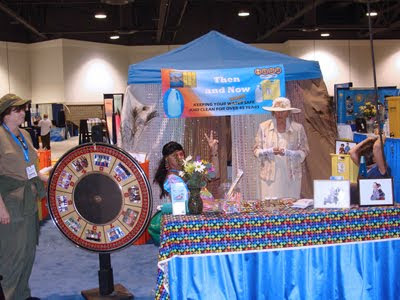 This year, the Hasa Pool Product booth sported the “Now and Then” theme. All the Hasa staff were dressed as their favorite 60’s television characters. Hasa Racing News: Moses and the #16 Hasa Pool Products team will race at the All American Speedway on 04/16/2011. Moses has three top-five finishes in six starts at this track and with six, he retains the record for the most top-ten finishes at this .333-mile high banked oval in the heart of Northern California. 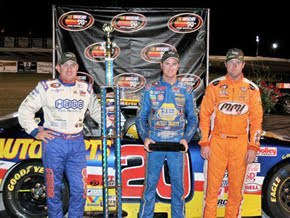 You can watch the K&N Pro Series Phoenix race on 04/21/2011 at 6:00 p.m. ET and 04/26/2011 at 3:00 a.m. ET on the Speed Channel. Moses finished eighth in the series season opener. For more information on Hasa Pool Products, please visit at www.hasapool.com . For more information on Moses Smith, please visit http://www.mosessmith.com/. About Hasa Pool Products: With years of experience in the swimming pool and water treatment fields and superior production capability, HASA, Inc. remains dedicated to helping its customers enjoy clean, clear, and safe water for many years to come. Hasa has been a green company for over 45 years. HASA has taken the lead with thousands of Hasa customers attending West Series race events over the past four seasons. BMR is proud to have them return to sponsor the No. 16 Hasa Pool Products Toyota Camry with driver Moses Smith. My husband and I are working the racing booth at the Western Pool and Spa Show in Long Beach, California this weekend. The event has a 60’s television program theme – can you guess who we dressed up as. . . Lucille Ball from I love Lucy; the couple – Lovey and Thurston Howell III - from Gilligan’s Island; the crew from the Star Ship Enterprise? . . . . . . . . . . give up? 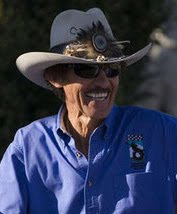 Well Paul and I are dressing like our NASCAR hero, Richard Petty, "The King." Now before you cry foul, you need to remember that one of the earliest telecasts of a NASCAR race was the 1960 Daytona 500, parts of which were presented as part of CBS Sports Spectacular. Richard Petty, Buddy Baker, Cale Yarborough, Ned Jarrett, David Pearson and Bobby Allison led NASCAR racing through an era that featured a schedule of more than 60 races a year on tracks from Florida to California to Maine. In fact Richard Petty won his first of 200 races on February 28, 1960 and that race was televised. So you can clearly see that NASCAR racing was a television presence even back in the 60’s. Petty a second generation driver (his father, Lee Petty, won the first Daytona 500 in 1959) won the Daytona 500, a record seven times! 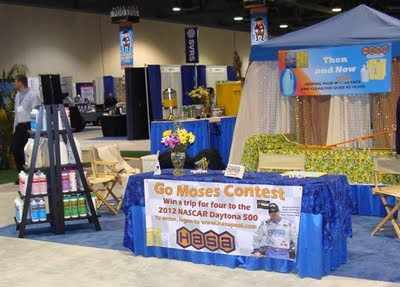 Now since mentioning the Daytona 500 throughout this post – allow me the pleasure of introducing you to the Hasa Pool Products ‘Go Moses’ contest. The Daytona 500 is NASCAR's signature event and kicks off the NASCAR Sprint Cup Series season. How would you like to win the opportunity to experience the excitement and pageantry of this event in person? 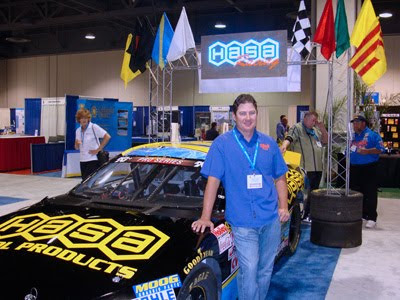 Follow Hasa Racing’s #16 Moses Smith of the NASCAR K & N Pro Series West throughout the 2011 season. Then logon and register at http://www.hasapool.com/ to win a trip for four (4) to the 2012 NASCAR Daytona 500 and/or other weekly prizes. Once you are registered, check back in at http://www.hasapool.com/ each week throughout the season to increase your chances of winning by taking the weekly quiz. You can enter once per day! Please check out the contest, enter, and then share the link with your friends and family.